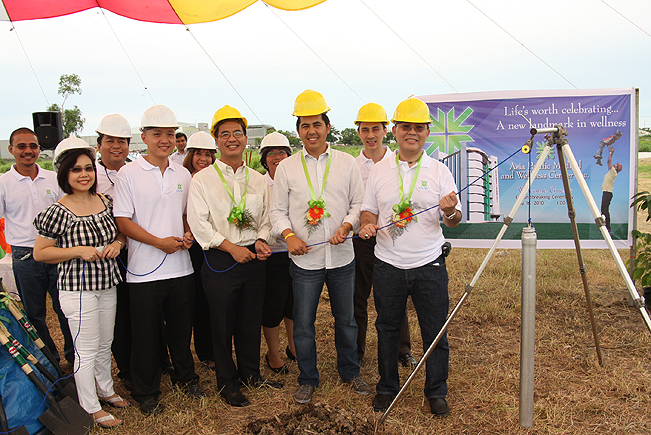 Asia Pacific Medical and Wellness Center Inc. (or APMWCI), the first building to rise inside Earth + Style Corporation’s business hub, One Asia Business Center, recently formalizes its development via a groundbreaking ceremony. Located in the heart of Jubilation New Biñan, Laguna, APMWCI is a medical and wellness building which features ultra-modern materials with neo-classic design. It aims to be the new medical landmark south of Metro Manila. Present during the groundbreaking are (from L to R front row): APMWCI Board of Directors, Dra. Mary Ann Tan; Kenneth Tiu, treasurer; Earth + Style Corporation’s GM, Raymond Alonso; Mr. Steve Naguiat, husband of Hon. Mayor Marlyn Naguiat-Alonte of Biñan; Dr. Antonio Elmer Tan, Chairman; (from L to R back row): Engr. Reynaldo Araos, project engineer; Dr. Simeon Emanuel Aquino II; Liz Manalansan; Dra. Maria Lisa Ang-Santo, president and Dr. Noel Cariño, vice president.